Combine the chopped apple, lemon slices, red grapes, sugar, wine, white grape juice and vodka in a large glass pitcher filled with ice. Stir to dissolve the sugar. Add the frozen green grapes to glasses and fill with the sangria. 2-1/2 pounds Yukon Gold, Red or fingerling potatoes, cleaned. 4 green onions, cleaned and cut into 1/4-inch to 1/2-inch pieces. Place cleaned potatoes in a large saucepan and cover with water. Place saucepan over medium high heat and bring to a boil. Reduce heat, cover potatoes, and let simmer until potatoes are tender, 7 to 10 minutes. Remove from heat and drain potatoes in a colander run under cold water and let cool. Cut the cooked potatoes into bite size pieces, and if desired remove the peel. Transfer potatoes to a large bowl. In a medium bowl, combine sour cream, yogurt, dill, salt and pepper. Pour sour cream mixture over cooled potatoes, add green onions, and toss to combine. Cover bowl with lid or plastic wrap and chill until ready to serve. Makes 6 to 8 side dish servings. Preparation Cut the chuck into 1 ½” cubes season with salt, pepper and Chipotle pepper. Drizzle with vegetable oil to coat all the meat. Set aside in a covered bowl 1-2 hours or refrigerate overnight. Remove meat from refrigerator 1 hour prior to cook time to get to room temperature. Cut green peppers into quarters remove stems and seeds put into large bowl Cut onion into quarter’s remove root end and skin and put into the large bowl. Put tomatoes into a bowl drizzle with oil, salt and pepper. Cut just the top off of the garlic sprinkle with salt and pour a little olive oil into garlic clove. Add to large bowl. Add the jalapenos and Manzano to large bowl. Coat all the vegetables with oil, sprinkle with salt and pepper set aside or refrigerate overnight. You want to make a chile paste with the dried red chiles and chipotles. Put all the chiles in a blender with a pinch of salt and cover with hot water not boiling and let sit until peppers are hydrated 30-40 minutes. 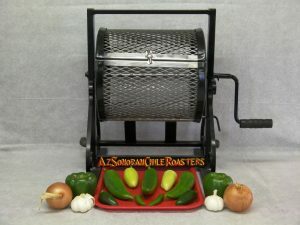 Then blend until smooth and strain through a small mesh strainer pushing with a spoon to get a nice smooth chile paste about 2 cups or more if you want a more intense chile flavor. Use this instead of chili powder you get a much nicer result in the finished product. 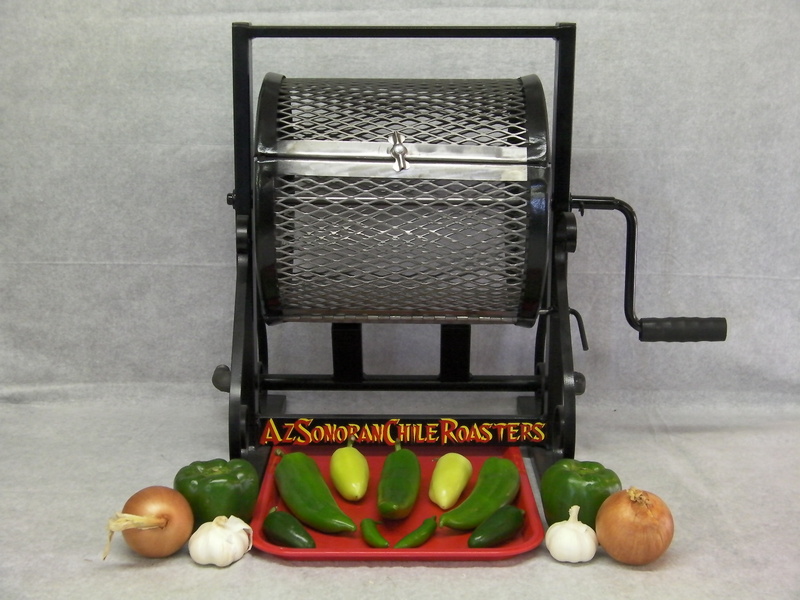 Prepare for Roasting Set up your Az Sonoran Chile Roaster in a safe location. See safety instructions. Divide meat in half and roast each half for 5-7 minutes to sear but not cook through. Remove from roaster and set aside. Or brown in a hot heavy skillet. Now roast all the vegetables in the large bowl for 5-7 minutes so skins are charred well. Remove from roaster and put back into large bowl and cover tightly. This will aid in removing the skins later. Add the tomatoes to the roaster and cook until skins are charred and ready to fall off. Remove from roaster and put back into bowl. Last add the green chiles to the roaster and cook for 5-7 minutes or until well charred. Remove from roaster and put into large bowl of vegetables and let cool. While all the roasted vegetables are cooling. Toast the cumin and red chile flakes in a clean dry frying pan on high heat until fragrant but do not burn. Remove from heat and add the oregano for 30 seconds or until fragrant and remove from pan do not burn the oregano. Remove skins from the green bell peppers and cut into ½”pieces. Cut onions into ½”pieces. Remove garlic cloves from husks, they should slide right out after being roasted. Crush or rough chop. Remove stems and seeds from the jalapenos and finely chop. Remove and skin and seeds from tomatoes and cut into quarters. Remove stems seeds and skins from the green chiles and cut into ½”pieces. Final Assembly Either cook in a Dutch oven or crock pot. I prefer the crock pot. Let it cook all day and you have a delicious meal that night. Add all your ingredients including the tomato sauce and kidney beans to the pot of your preference and cook until meat is tender. 3-4 hours stove top. 6-8 hours crock pot. I found the no extra liquid was need when cooked in the crock pot. Great winter green chile stew recipe. • 1 Tbs each cumin seed, coriander seed and Mexican oregano lightly toasted. 1. Roast cumin and coriander in small skillet over medium heat until they release their toasted aroma and add Mexican oregano at end to lightly toast. Grind them in mortar and pestle or food processer. 2. Have onions, pork, green chiles and 2 cups chicken stock prepared and ready. 3. In a heavy stock pot, preferably cast iron, heat oil over medium heat. When oil is warm, add flour and brown to make a roux. Stir constantly with a wooden spoon, reaching all parts of the bottom of the pan to keep flour from burning. The mixture will bubble and foam as it starts to brown, then settle into a smooth consistency. The color will change from white to an old copper penny color and the odor will go from flour and oil to a roasted aroma. Be careful not to burn the flour, as you will need to start over. If in doubt, stop browning at a slightly lighter color. 4. To stop the browning process, add the onions and 2 cups water. It will hiss and steam as you add them, stir mixture well to cool roux and brown the onions. When onions have started to brown, add pork and brown. 5. Add chiles and remainder of chicken stock, stirring well. 6. Add herb mixture to chiles, along with garlic, salt and black pepper. 7. Stir mixture well, reduce heat to a low simmer and check on every half hour or so until meat is tender. 8. If desired, tomatoes and potatoes can be added at start of simmering for a different flavor profile.